Looking for Oil Extraction Machine ? 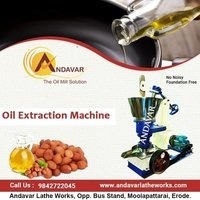 Andavar The Oil Mill Solution is one of the leading manufacturers of Edible oil / non edible oil mill machinery since 1967.From the 52 years wide experience,Andavar the Oil Mill Solutions are Research& Development (R & D) Machinery. Herbal & Essential Oil Extraction Machine With our expertise ...With our expertise and trustworthiness, we are engaged in offering an optimum quality range of Herbal And Essential Oil Extraction Machine.